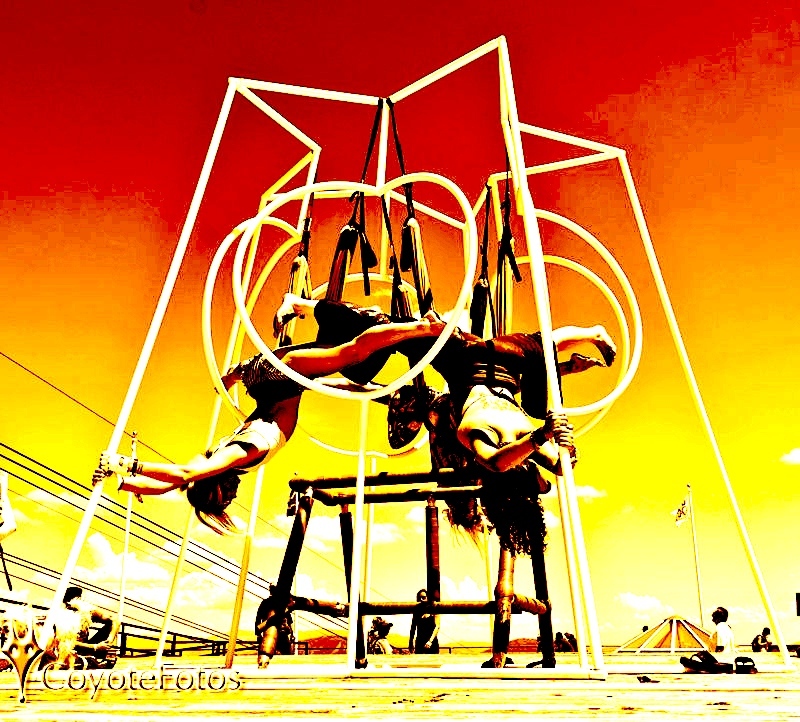 The Quantum Playground will bring Infinite Fun and Embodied Play to your event! I know it would be very well received and there are many ways to create a truly unique, quantum fun experience. 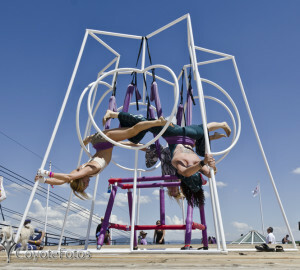 It can be presented as a functional-art installation, play structure, and center piece as a heart activation portal. It can be offered for work/play-shops and training purposes. It can be used for ‘play-formances’ and demos, all facilitated by the creator, Jen Healy (and personal assistants). It can be used for open play time, exponentially increasing the fun-factor at any event. My team would be a total of 5 people to help build, manage, and break down. that stands 12 feet tall and 14 feet wide (see attached photos). It is the perfect center piece for any arena. 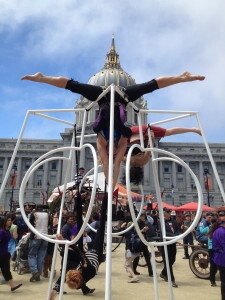 It has been a huge hit at Earth Day SF, New Living Expo, Symbiosis, Movement Play, Harmony Festival, Wanderlust, Enchanted Forest, Divine Play, Earthdance, Burningman, Bhaktifest, 11-11-11 Unification Gathering, and Envision Festival (Costa Rica), with a new bamboo pyramid design. bringing and setting up all the equipment, as well as demos, trainings, and play-formances/workshops 2 times a day by Jen Healy and assistants. There will always be at least one person available at the quantum playground, for supervision and instruction. We are available for longer or shorter experience. Please inquire within. THE QUANTUM PLAYGROUND IS A REVOLUTIONARY WAY FOR MINDFUL EMBODIED PLAY, CONSCIOUS MOVEMENT, AND SERIOUS FUN! INNOVATIVE GEOMETRIC PLAY STRUCTURES COMBINED WITH AERIAL YOGA SWINGS AND LOW-LEVEL MONKEY YOGA BARS ADD A NEW TWIST TO ORDINARY PLAYGROUND EQUIPMENT. THEY WILL DELIGHT, STRENGTHEN & STRETCH YOU ON EVERY LEVEL OF YOUR BEING!! It is a sculpture, a stunning work of art, built according to Sacred Geometry. It’s a play structure. It’s a monument to the Golden Mean, of Divine Proportion and the Human Quest for Enlightenment. 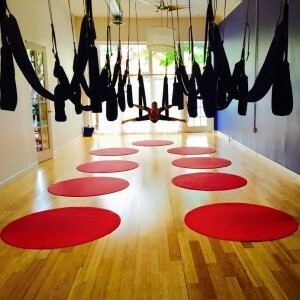 It’s totally cool when blended with Yoga Monkey Bars and Aerial Yoga Swings. So many ways to play! Many other designs available. “Heart Star” Portal designed by the creative genius Harlan Emil Gruber. Please see transportals.org. Prices upon request. 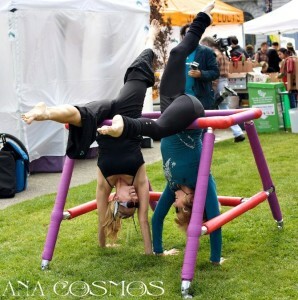 YOGA MONKEY BARS are colorful, padded bars that are light-weight, easy to assemble & disassemble, comfortable, come in a variety of colors and can be portable, fixed to the wall and floor, and / or used inside or out. These versatile bars can be used at home, in yoga-dance studios, health clubs & therapeutic settings for fitness, yoga (group and solo), rehab, assisted and non-assisted stretching, performances and simple play. 1. Consultation. Sacred geometrical layout and equipment recommendations. Can be done on site or send us your measurements and room specs (if you know them) re: wall, ceiling studs and we will send our recommendations. 2. Workshops, Demos, and Trainings. In person training on the equipment. Empower your teachers, trainers, yourself. Know how to play safely and effectively with the emphasis on fun, getting into great shape, and experiencing optimal health. Bring your body and playground to life. Supplemental, memory-enhancing dvd’s included. 3. Special event and gatherings. 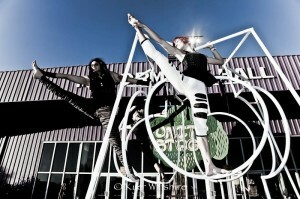 Wow your friends and audience with this functional art piece that takes entertainment and art to the next level. Both “Play-formances” and “Prayer-formances” are available with the very talented and entertaining dynamic group assisting Jen Healy and friends. Prices available upon request. 4. Online community membership with continuing Quantum Playground content, webinars, and your chance to showcase your Playground. 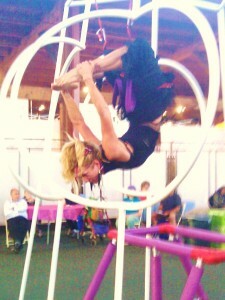 Jen has also been an experienced dancer, athlete, yogini, and natural arcobat all her life. After 15 years of exploring the Yogic Arts, she has been inspired to create a new paradigm in exercise and yoga therapy. Combining her training with her passion for embodied movement and sacred play, the vision of a “Quantum Playground” has been born. A pioneer and revolutionary, Jen Healy has created a new wave of conscious movement to awaken the mind, body, and soul. More information is available at www.zenhealyng.com. Harlan Emil Gruber has combined his interest in science and art into a respected design career. A student of Physics at Emory University and of Electrical Engineering at University of Miami and Georgia Tech, Harlan Emil subsequently received a degree in the field of Environmental Design from Parson School of Design, New York (1985). Immediately following the completion of his studies, Mr. Gruber joined the design firm SITE Projects of New York before launching his independent career in 1987. 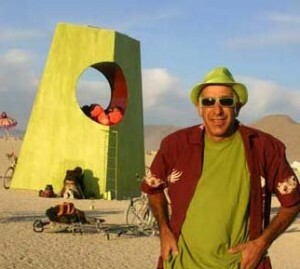 He has become highly regarded for his sculpture, furniture design, interior retail design, and for his continuing study of designs for future habitat.